Here’s a very simple little spell that works great, especially around Midsummer. Timing: Noon on a day when the moon is in the waxing phase. Preferably as close to the Summer Solstice as possible. 1) Think of one bad habit you have that you would truely like to rid yourself of. Write it down in the center of the of paper. 2) Now fold the paper top to bottom, then left to right, so that it is folded into forths with the writing inside. 3) As you fold the paper, visualize that habit being trapped inside the paper. 4) Now light the candle and meditate on it’s flame for a moment. 5) When you are prepared to continue, hold the paper in a diamond shape, with the writing down at the bottom. 7) This spell should be cast outside, so that the ashes of the paper can fall to the the earth. As they do so, visualize the earth as taking your habit and absorbing it. Be sure to leave a gift for the earth in exchange for taking your habit. Note: This spell also works extremely well with balefires or the fire at your Litha ritual. Simply toss the paper into the flames and chant. Do not attempt to hold it over the flames as you would with a candle. Before the rite, make up a small cloth pouch filled with herbs such as lavender, chamomile, St. John’s Wort, vervain, etc. Pour all your troubles, problems, pains, sorrows and illnesses, if any, into this petition as you construct it. Tie it shut with a red string. Place this on the altar for use during the rite. And the reign of the Oak King is ended. The waning of the year begins. Ring the bell three times. And the Earth is bathed with warmth and life. Now is the time for purification. Charge my life with wonder and joy. Meditation. Ring the bell three times. Imbolc is one of the four principal festivals of the Celtic calendar, celebrated either at the beginning of February or at the first local signs of Spring. Originally dedicated to the goddess Brighid, in the Christian period it was adopted as St Brigid’s Day. In Scotland the festival is also known as Latha Fhèill Brìghde, in Ireland as Lá Fhéile Bríde, and in Wales as Gwyl Ffraed. While in the Northern Hemisphere Imbolc is conventionally celebrated on 1 February, in the Southern hemisphere it is sometimes celebrated on the calendar date, but those who see it primarily as a celebration of spring may move it to 1 August.Fire and purification is considered by many to be an important aspect of this festival. Brigid (also known as Brighid, Bríde, Brigit, Brìd) is the Goddess of poetry, healing and smithcraft. As both goddess and saint she is also associated with holy wells, sacred flames, and healing. To some, the lighting of candles and fires represents the return of warmth and the increasing power of the Sun over the coming months. The holiday is a festival of the hearth and home, and a celebration of the lengthening days and the early signs of spring. Rituals often involve hearthfires, special foods, divination or simply watching for omens (whether performed in all seriousness or as children’s games), a great deal of candles, and perhaps an outdoor bonfire if the weather permits. If you also want to play online casino games, check out this sources for more information. This season belongs to Brigid, the Celtic goddess who in later times became revered as a Christian saint. Originally, her festival on February 1 was known as Imbolc or Oimelc, two names which refer to the lactation of the ewes, the flow of milk that heralds the return of the life-giving forces of spring. Later, the Catholic Church replaced this festival with Candlemas Day on February 2, which is dedicated to the Virgin Mary and features candlelight processions. The powerful figure of Brigid the Light-Bringer overlights both pagan and Christian celebrations.In keeping with the policy of the Catholic Church to subsume pagan festivals into Christian feast-days, the Day of Bride became equated with Candlemas on February 2nd, the feast of the Purification of the Blessed Virgin Mary. Certainly, the service most used for this day in the medieval church made much of this symbolism, playing upon images of the appearance of divine light in the darkness of human sin, of renewal and rebirth of light in the dark time of the year, and of the new light of heaven come to transform an old world.In Britain, Candlemas was celebrated with a festival of lights. In the dark and gloomy days of February, the shadowy recesses of medieval churches twinkled brightly as each member of the congregation carried a lighted candle in procession around the church, to be blessed by the priest. Afterwards, the candles were brought home to be used to keep away storms, demons and other evils. This custom lasted in England until it was banned in the Reformation for promoting the veneration of magical objects. Even so, the symbol of the lighted candles had too strong a hold on the popular imagination to be entirely cast aside. there’ll be two winters in the year. Various other names for this Greater Sabbat are Imbolgc Brigantia (Caledonni), Imbolic (Celtic), Disting (Teutonic, Feb 14th), Lupercus (Strega), St. Bridget’s Day (Christian), Candlemas, Candlelaria (Mexican), the Snowdrop Festival. The Festival of Lights, or the Feast of the Virgin. All Virgin and Maiden Goddesses are honored at this time. All Virgin/Maiden Goddesses, Brighid, Aradia, Athena, Inanna, Gaia, and Februa, and Gods of Love and Fertility, Aengus Og, Eros, and Februus. Angelica, Basil, Bay Laurel, Blackberry, Celandine, Coltsfoot, Heather, Iris, Myrrh, Tansy, Violets, and all white or yellow flowers. Amethyst, Bloodstone, Garnet, Ruby, Onyx, Turquoise. Pumpkin seeds, Sunflower seeds, Poppyseed Cakes, muffins, scones, and breads, all dairy products, Peppers, Onions, Garlic, Raisins, Spiced Wines and Herbal Teas. Little fried cakes, dipped in honey and nutmeg. 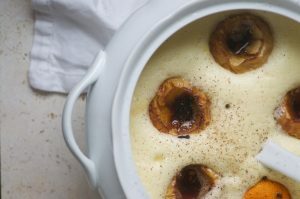 A delightful sweet Imbolc treat. Beat the egg together with the wine. In another mixing bowl, sift together the flour, cinnamon, sugar and salt. Add the flour mixture to the egg mixture. Stir until blended through. Let sit for 30 minutes. In another small bowl, mix the honey and nutmeg. In a skillet, heat up about a 1/2 inch of oil. Drop a tablespoon of batter into the oil and fry until golden brown. Drain off the oil, and dip into the honey mixture. Seeds are often used in any Imbolc recipe. Here is a simple seed bread that is just delicious. Preheat your oven to 350F. With a hand mixer, blend together the poppy seeds, oils, eggs, sugar, vanilla and half n half. Add flour and baking powder. Mix together on high speed for 30 seconds. Pour into 2 greased loaf pans. Bake for one hour or until tops of loaves are brown. **Equal parts of cinnamon, nutmeg, and allspice. Sift the flour, soda, and baking powder into a non-metal bowl. Add the mixed spice and ginger. Next add the brown sugar and raisins. Mix. Make a well in the center of the flour mixture. In a small sauce pan, melt the butter and the syrup over a low heat, then pour liquid into the well in the middle of the flour mixture. Add the beaten egg and the milk, and mix very well. Pour into a well greased 2-lb loaf pan and bake in a preheated oven at 325 degrees for 40-50 minutes. This bread can be made the night before as it improves with age. Makes 8-10 servings. This is all done in one pan, so clean up is a breeze! Preheat oven to 350 degrees. Mix flour, sugar, poppyseeds, baking soda, and salt with a fork in an ungreased 9″x9″x2″ baking pan. Stir in the remaining ingredients, except the powdered sugar. Bake 35-40 minutes or until toothpick inserted in center of cake comes out clean, and the top is golden brown. Remove from oven and cool. Sprinkle with powdered sugar. Makes 8 servings. A hearty Irish lamb stew that’s pretty easy to make. Saute the bacon in a large skillet, and then set aside (save the meat and the fat). In a bowl, coat the lamb meat with salt, pepper and flour. Brown in the bacon fat. Remove the lamb from the pan and put in a large stock pot. Leave about a quarter cup of fat in the pan. Saute the garlic and one chopped onion until soft. Add 1/2 cup of water to the pan to deglaze then pour pan contents into the stock pot along with the bacon, beef stock and sugar. Simmer for 1 1/2 hours or until tender. Add the rest of the ingredients and simmer for another 20 minutes. Imbolc is a festival of light, reflecting the lengthening of the day and the hope of spring. White, the color of light and milk, appears predominantly. Use a white altar cloth, add white and yellow flowers and candles. Use votives or tea lights in glass jars that the kids can decorate to get them to participate. Be sure to use extra caution with candles if you have little ones. You may even choose to abstain from lighting them altogether and just keep them on the altar unlit for symbolic reasons. If candles are absolutely out of the question, use strings of holiday lights or make candles out construction paper. White, Pink, Red, Yellow, lt. Green, Brown. 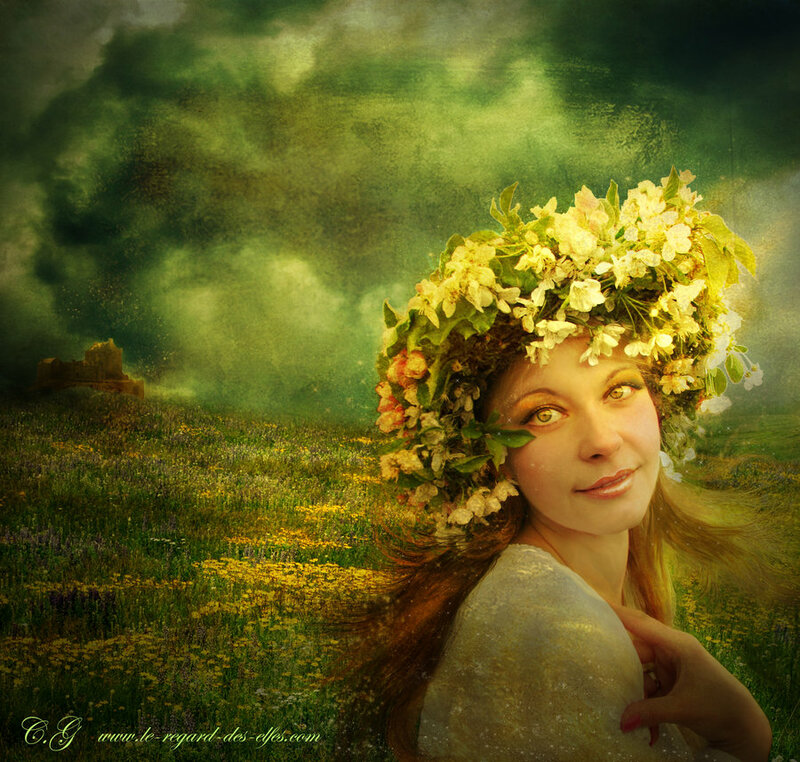 Imbolc is good for psychic work: still the dark time of the year, but looking toward spring. It’s also a good time to make your space hospitable for such work, banishing old energy to clear the way for new. Traditionally, witches purify themselves and their space at Imbolc. Any kind of cleansing or banishing will do, but consider ones that include fire and water, sacred to Brighid. Once purified, you’re ready to go further; at Imbolc, covens initiate new witches. The spark of summer dances in the future now; Imbolc is a good time to seek inspiration, especially for healers and smiths of words or metal. Imbolc is a white time, burning with inspiration and protection, cool with healing and purification. Prophesy flares, painting luster on the dark. Light your candle, call on Brighid, and know that under the snow the seeds of spring stir. This is a time for purity, growth and Renewal. Spells that celebrate the Reunion of the Goddess and the God, fertility, and dispensing of the old and making way for the new are appropriate during this time. * This is traditionally a time of purification — clean your house! If you have any Christmas greenery lingering, burn it now. Make your own Brighid’s crosses and hang them up, especially in the kitchen where her influence can bless your food. * Put out food — cake, buttered bread and milk will do — outside your door: Brighid and her cow walk through the neighborhood tonight, and will appreciate your offering. * Leave a silk ribbon on your doorstep for Brighid to bless: It can then be used for healing purposes. * Meditate upon what you would like to see grow in health and strength this year: for yourself, your family, your community, the Earth, and ask for Bride’s blessing upon your prayers. * Candle Lighting, Stone Gatherings, Snow Hiking and Searching for Signs of Spring, Making of Brideo’gas and Bride’s Beds, Making Priapic Wands, Decorating Ploughs, Feasting, and Bon Fires maybe lit. * Light a candle and burn sandalwood incense. * On Imbolc Eve, leave buttered bread in a bowl indoors for the faeries who travel with the Lady of Greenwood. Next day, dispose of it as the “essence” will have been removed. * Place three ears of corn on the door as a symbol of the Triple GOddess and leave until Ostara. Here is a quick and easy recipe for a fiery Beltane Incense! Blend well! You can burn this blend on a piece of charcoal or toss it into your Beltane Fire! !